The North American Aviation T-28 Trojan is a piston-engined military trainer aircraft used by the United States Air Force and United States Navy beginning in the 1950s. 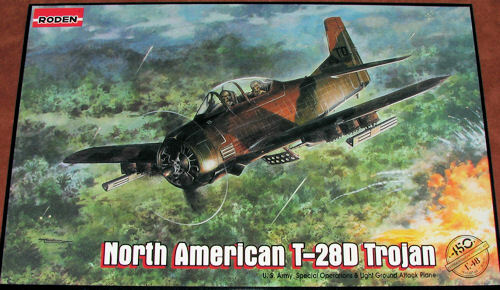 Besides its use as a trainer, the T-28 was successfully employed as a Counter-insurgency (COIN) aircraft, primarily during the Vietnam War. Though none are currently in military use, the aircraft was widely exported in all of its different variants and is a popular warbird, due to the easy availability of parts and ease of maintenance. T-28As converted for the counter insurgency (COIN) role. Fitted with six underwing hardpoints. Total 393 converted - 321 by Pacific Airmotive licensed by NAA, plus 72 by Fairchild Hiller. T-28 Nomad Mark I - Wright R-1820-56S engines 1300 hp. T-28As converted for the counter insurgency (COIN) role. Fitted with six underwing hardpoints.Wright R-1820-76A 1425 hp. T-28Ds used for attack training by the USAF. This second T-28 release by Roden is basically the same kit as their T-28B with the addition of a new sprue for weapons used by the T-28D and a new decal sheet. Below is a recap of an earlier preview on the T-28B with additions regarding the upgrade. The kit itself is very nicely molded with the expected engraved panel lines. I found some depressed areas on the gear doors and some flash on a few parts. There are also some ejector towers that may need to be trimmed before assembling the parts. 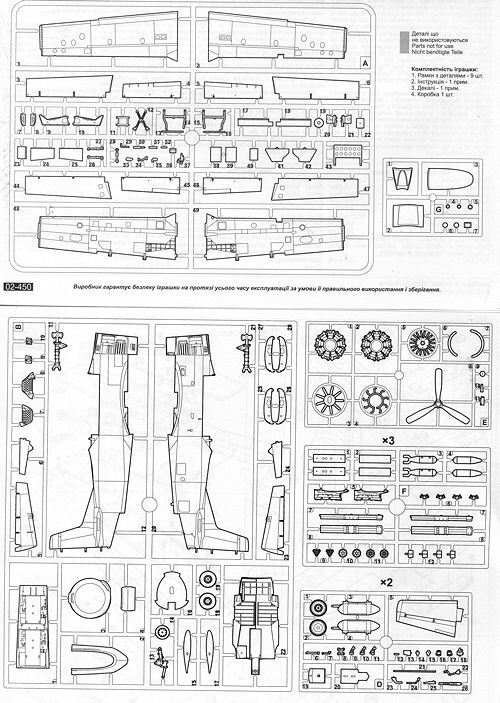 It is obvious that there will be several boxings of this kit as the base sprues include gun pods as used by the T-28D and a separate rear section under the fin to accommodate the tailhook of the T-28C. It also has areas in the lower wing to open up for installing bomb pylons on the COIN version. The 1820 engine is well done with a wiring harness. The cockpit has separate rudder pedals, control sticks, instrument panels and seats. Armor plating for the seats is on the sprue but not used in the trainer version. The control sticks are especially frail as, despite gentle sawing with the finest blade, I broke both of them at exactly the same place when removing them from the sprue. You have decals for the instrument panel or you can use separate aftermarket instruments as the bezels are molded on the panels. The proper low pressure nose wheel for the USAF version is supplied in the basic sprues. Both the flaps and the ailerons are separate items. It was normal for the flaps to be down when the aircraft was on the ground. I also noticed that the little actuating rods for the three cowl flaps were part of the kit. The speed brake can also be posed down. This was handy for maintenance as the UHF radio was in the open speedbrake well. Gear wells are nicely done though, like the speedbrake well, they are fictitious and basic. The gear is nicely detailed and the nose gear is quite scale, which means it may be easily broken. This is especially true once sufficient nose weight is installed, as a great deal will be needed. I should point out that I found the nose gear too short or main gear too tall when building my T-28B as it ended with a distinct nose down stance. You may want to keep this in mind when building this one unless the taller T-28D nose tire compensates for this. Finally, the canopy sections are separate with the glass separate from the frame for the rear piece. The additional sprue is pretty much additional weapons. This includes the additional racks needed as well as bombs and two different types of rocket pods. Three identical sprues are given so you can really load this one out if you wish. Instructions are well done with references for four major paint lines. All the colors needed during build are clearly shown. There are markings for three planes. First is a camouflaged version, shown on the box art, as assigned to the 606 SOS based in Thailand in the late 1960s. Standard SEA upper camo colors with a black underside. The next two are in greys. The USAF version is in overall ADC Grey and from the 4400CCTS at Eglin AFB in 1964. The other is a CIA unit based in the Congo during early 1966. It is listed as Light Gull Grey over ADC Grey. The decals on my kit has several glitches. One is that some items, like the instrument panel decals, are off register. The other is that the ink is smeared in several places, a real disappointment. Roden decals do not have the best reputation anyway, but it is still a shame that these were allowed to make it through quality control (assuming Roden has such a thing). I am sure that there will be aftermarket decals for this and hope that the Congo ones are done. I am very pleased to see this version being done and based on how well the T-28B has sold, I am sure this one will do equally as well. From experience I can tell you that the kit will take careful building, but the end result will be a very nice model. Thanks to Squadron Products for the preview kit. Get yours at your local shop today.